Fortified with iron, vitamins and trace elements, this fast acting, veterinary approved liquid formula is designed to support the performance of the hardworking equine athlete. The sports horse demands more of his body to perform to his full potential. As his performance increases so too does his requirement for specific nutrients. It’s well known that essential salts are lost through sweat. However, not only are electrolytes lost, so too is iron. Iron is vital for the health and performance of the sports horse. This is where EnerG becomes so valuable. 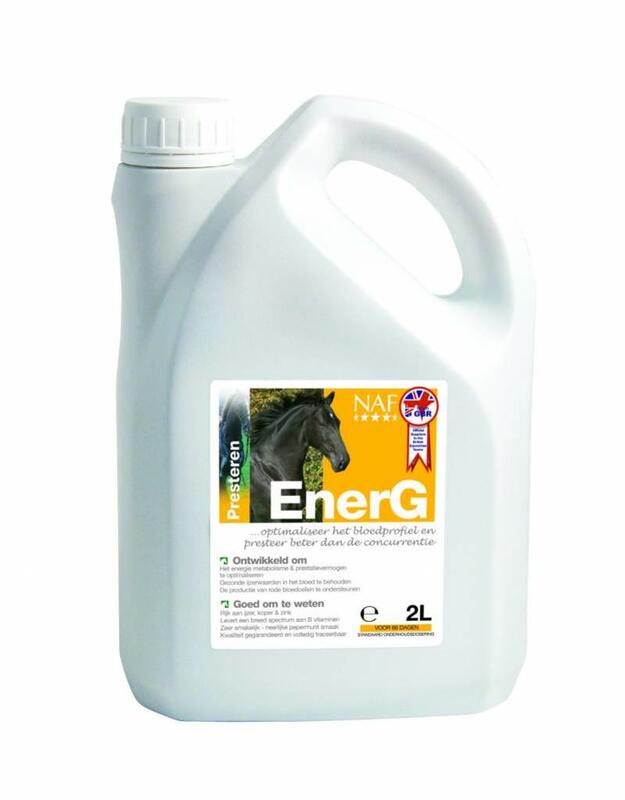 Not only rich in iron, EnerG also contains the correct balance of copper and zinc, both important nutrients required by the horse to maximise the benefits of this unique synergistic formulation, thus optimizing energy metabolism. EnerG contains iron, copper and zinc, together with an unrivalled spectrum of Vitamin B complexes, to support the health and efficiency of red blood cells and energy metabolism. EnerG also contains Vitamin C, for it’s antioxidant qualities, together with Vitamin K to support the benefits of Vitamin C. Importantly, EnerG is a carefully targeted product that simply provides the nutrients necessary to support blood profiles and energy metabolism, so it can be safely added to any diet.